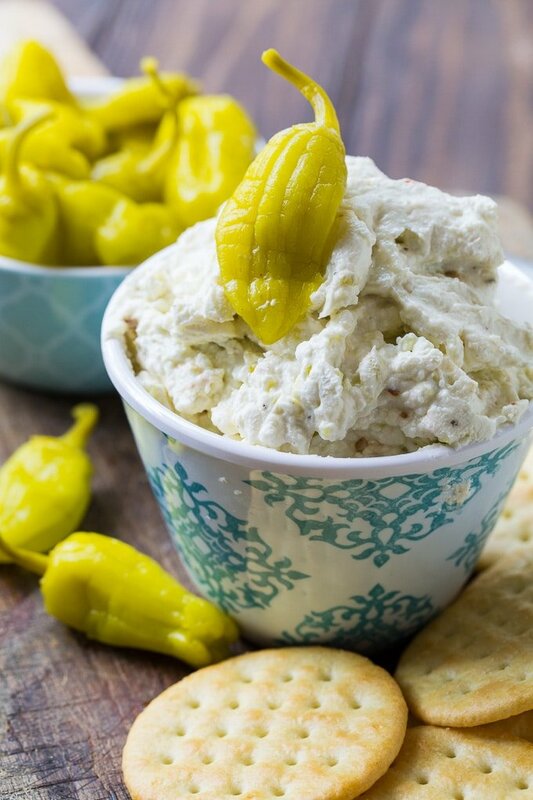 Three Cheese Pepperoncini Spread is a Mediterannean-style appetizer that goes great with crackers. 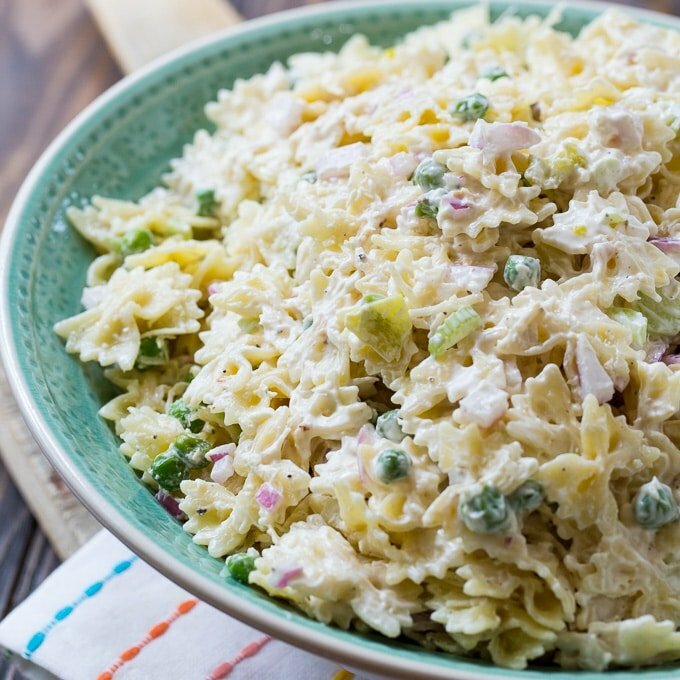 This creamy dip has lots of cheese flavor and a lot of kick from some pepperoncini peppers. I also add some crushed red pepper flakes to add to the spiciness. 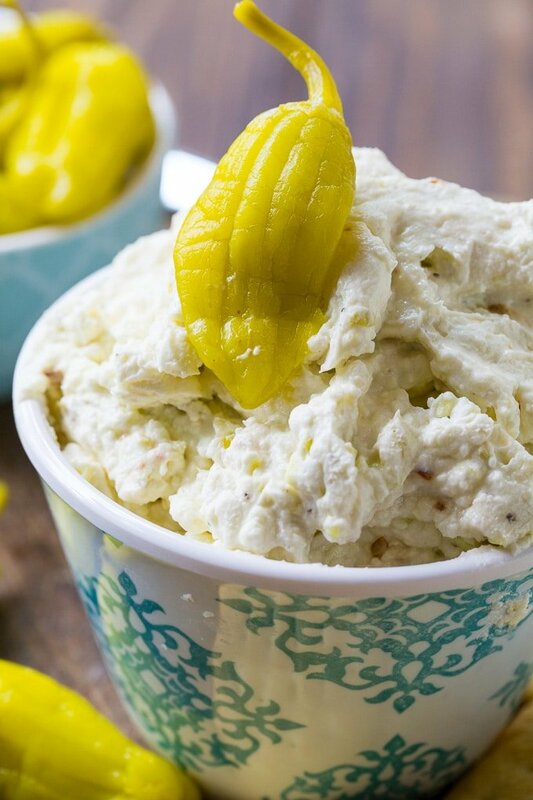 Three Cheese Pepperoncini Spread makes a delicious appetizer for parties and potlucks and can be made in less than 10 minutes. No matter how busy you are, you have time to make this incredible cheese spread. Cream cheese, feta cheese, and blue cheese are combined with a little olive oil to thin it out, plus some juice from the jar of pepperoncini peppers. A clove of garlic is also added for flavor. If pepperoncini peppers are one of your favorite parts of a Greek salad, you are going to love this cheese spread. The feta cheese and blue cheese combine to create a salty dip packed full of flavor. In addition to being delicious spread on crackers, this Three Cheese Pepperoncini Spread works well as a dip for crudites. I especially love it spread on cucumber rounds! Three Cheese Pepperoncini Spread is a Mediterannean-style appetizer that goes great with crackers. 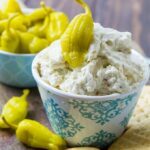 This creamy dip has lots of cheese flavor from cream cheese, feta cheese, and blue cheese and a lot of kick from some pepperoncini peppers. 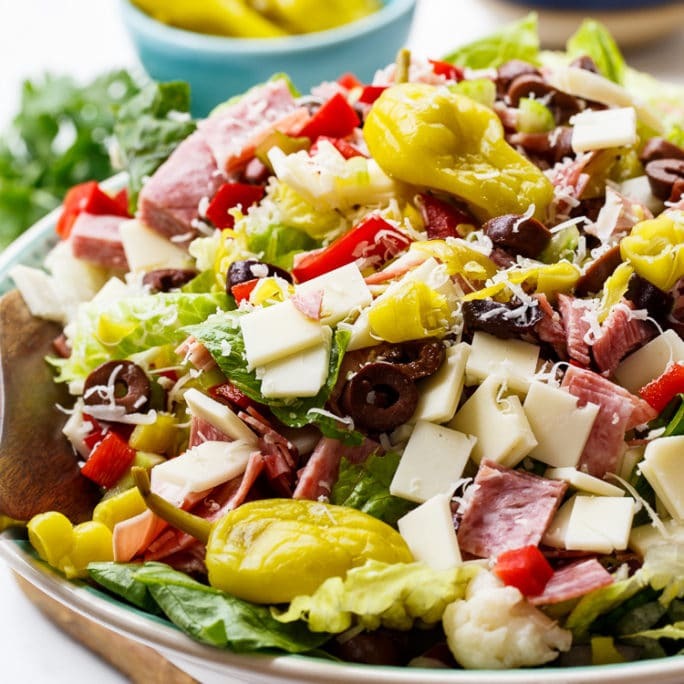 Combine cream cheese, feta cheese, blue cheese, oil, pepperoncini juice, black pepper, crushed red pepper, and garlic in a food processor and process until smooth. Add peppers and process until peppers are mixed in and finely chopped. Better if chilled for at least and hour before serving. This entry was posted in Appetizers and tagged pepperoncini peppers. Bookmark the permalink.